More shawl knitting this weekend, but not quite as much as I'd hoped for. Saturday kind of turned into a big nap day, but I made up for it on Sunday. I'm 24g into my 100g skein so far, and it looks like I'm keeping pace. 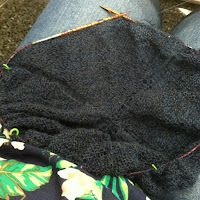 The shawl rounds are definitely getting longer, but it's not a total slog yet. My goal is to have the body done this week, and then pound out the border. So, I'm sorry you're just going to have lots of shawl-in-progress pictures this week, but I do want to get this done soon, and I'm being unprecedentedly monogamous about it. I stole photos from my Instagram today, because I've been really bad about remembering to take pictures this week. This is my own personal failing, and I will endeavor to be better about taking pictures going forward. Truthfully, there's not really a whole lot to photograph here. This is a square shawl, in garter stitch, and it's at the point where no matter how much I knit on it, it'd not going to look too different yet. When people I love aren't doing well, I knit for them. It's about the only thing I know how to do-my words feel wooden and insincere, and I don't really know how to offer comfort. But I can knit. This shawl is for someone I'm very close to, and that's all I'm really going to say for now. So I knit. 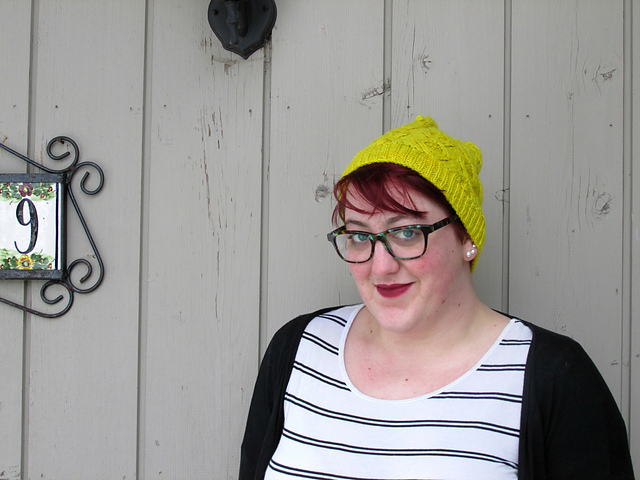 I wanted something big and comforting-a light blanket, a cozy shawl, or a thick scarf. Something that could be whatever this person needs it to be at the moment. Right now the sides of the square are about half as long as they need to be, which means the body is about a third of the way done. Some quick and dirty math says that I've knit about 11,840 stitches so far, with about 25,680 to go before I can start the border-fortunately, this is the only thing I'm working on right now, and hopefully I'll be able to get through a bunch of the body over the weekend. A few months ago I was destashing some yarn on Instagram and my best friend Caitlin spied this ball of Mochi Plus. 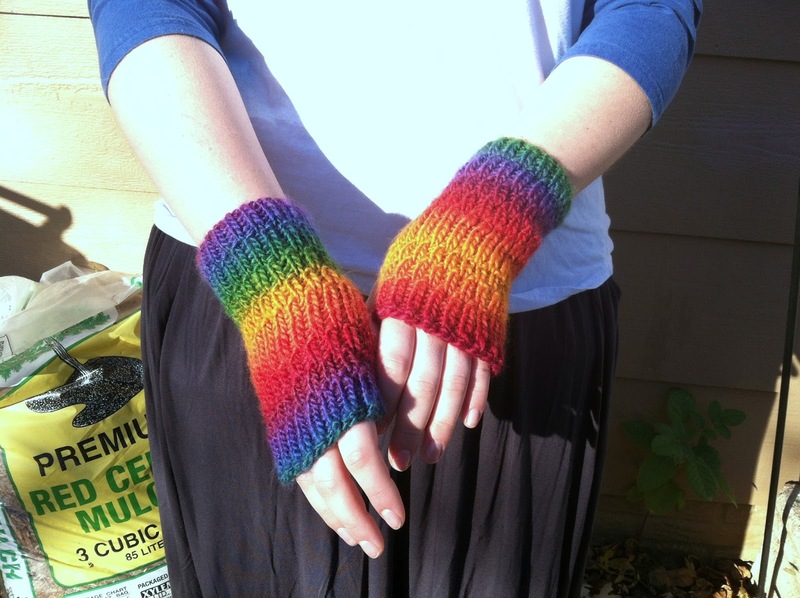 She said, "If I could knit or crochet or anything, I'd totally buy that yarn from you," to which I replied, "Well, if you love it so much, I'll make you something with it!" Several times over the course of our friendship we've done little craft swaps-I'll knit her something, and she'll make me jewelry. 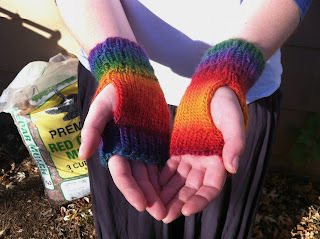 So now Caitlin has an amazing new pair of rainbow mitts and I've got a new necklace headed my way. I sat on this yarn for an embarrassingly long time-I think we agreed to the swap sometime around February? About a month ago she said that she'd be in my neck of the woods mid-October, so that lit the fire under my bum to get these knit up. 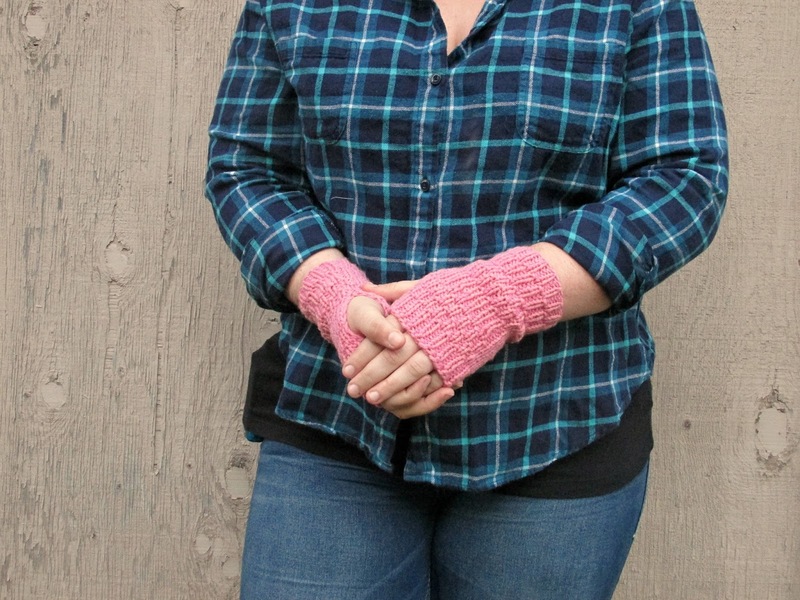 I looked at hundreds of patterns to try and find the best one for this yarn, and then I ended up just using one of my own. The basic ribbing works great with the color changes, it doesn't matter that this yarn doesn't have great stitch definition, because there's not really any detail to lose. 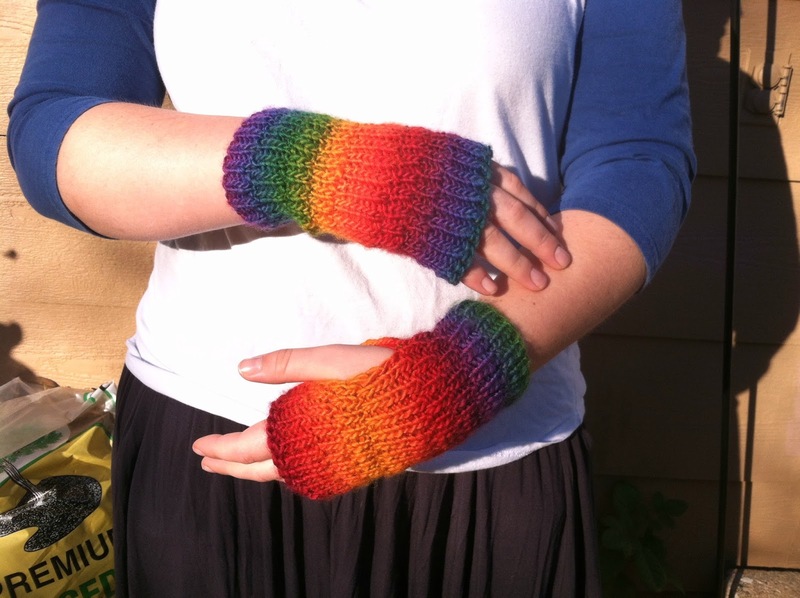 I knit these during my lunch breaks over the course of a week, and I'm so happy to have them done and gifted. 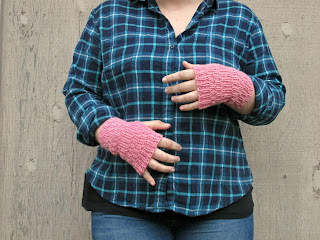 Every time I saw that yarn on my bookshelf I felt like a terrible friend for not having knit it up yet, but in the end it worked out perfectly, and Caitlin is so much more thrilled with these mitts than I would have been if I'd kept the yarn for myself. Yarn: Crystal Palace Yarns Mochi Plus "Tapestry Rainbow"
This weekend I got almost no knitting done, because I was too busy working at a haunted house! 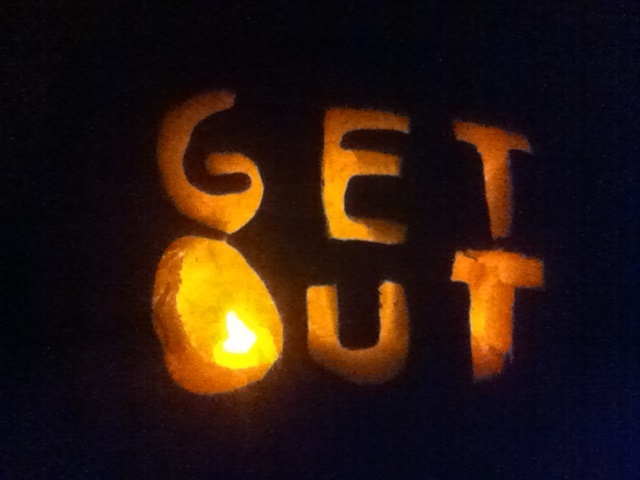 Our high school theater club does a haunted house every year as a fundraiser, and I was asked to be an adult inside the house to step in if anyone was disruptive. As much as I love Halloween, I didn't actually go to many haunted houses until after college-I can be kind of a wuss. I've actually been to the high school's haunted house the past three years, so it was really cool to see it from the other side, and I had tons of fun hanging out with the kids and throwing fake blood everywhere. The room I was in was full of jack o' lanterns (pro tip: don't cut jack o' lanterns two weeks before you need them-they'll get moldy and gross!). After being in a room full of rotting pumpkins for two days, getting to smash them all after the house closed Sunday night was really rewarding! Even though I'm still super tired from the busy weekend, I really enjoyed it. It was so great to see our high school theater kids step up and take ownership of this project, and they really had fun with it. Hopefully they'll ask me to help out again next year, but if not, I'll definitely be walking through as a customer! 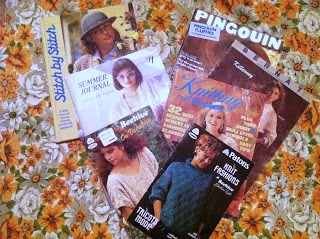 There is a very special place in my heart for vintage pattern booklets. There are so many great designers working now, and so many fantastic new patterns being written, but whenever I come across a pattern book from the 80s, I have to pick it up. I've always had a thing for the 80s-even when I was in college and it was soooo not cool to be into the 80s, I harbored my secret obsession. I love big hair and big accessories, I love pop music, I love goth and punk and the second British invasion. In all my baby pictures my mum is wearing these huge late-80s sweaters, and all my dress up clothes from when I was a kid were old 80s prom and evening dresses. I was fortunate enough to find these earlier this week in a thrift store, and they feel so homey to me. 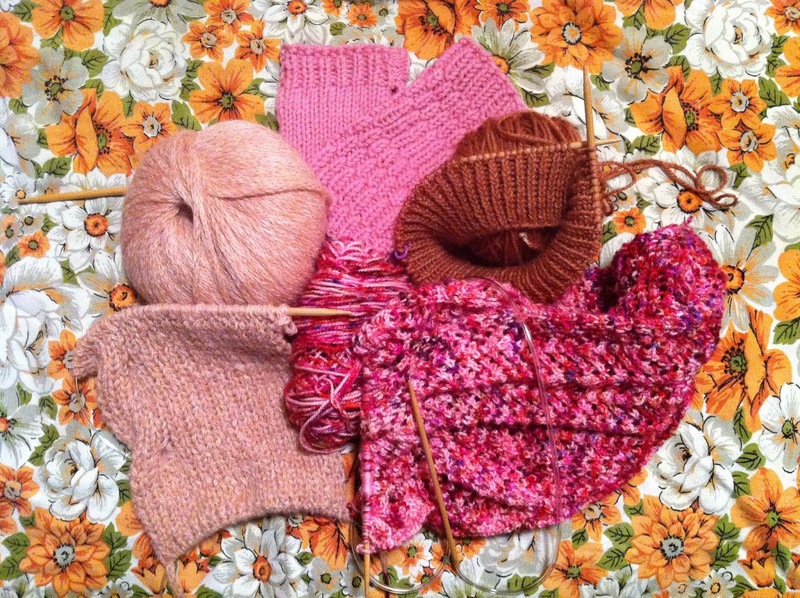 There are a few things that I could definitely see myself knitting and loving in here (somewhere in here is a pattern for a bobbled cardigan that is my everything), but so far for the most part I keep these around to look at for inspiration or to lift my mood. I have plenty of other old knitting patterns around, dating back to the 1890s. I have soft spots for pretty much every decade, but I have a weird kind of nostalgia for the 80s, despite not actually having lived through any part of them. I love my entire knitting library, but I am especially fond of these books and pamphlets. I grew up in New England, so for the first seventeen years of my life I was pretty spoiled for fantastic autumns. Since moving to the midwest, fall's been less of a big deal for me, because it always seems like the leaves turn yellow and fall and get rained on all at once. This year, however, we've been pretty spoiled so far. Yes, the ground is soggy, yes it's been foggy and rainy, and yes, most of the leaves are shades of yellow instead of spectacular reds and oranges and purples. But the past few days as I've walked home from work, I've been lucky to be able to watch leaves fall, and the sidewalks are paved with yellow leaves, and it's actually shaping up to be a pretty good fall. It's looking like we've got another month before snow its going to be a problem, which is refreshing. I've been making good time on my mum's sweater-the second sleeve is done, and I've just finished the bottom ribbing for the body. This is the perfect knitting for this time of year-a nice, woolly, neutral tweed, plain stockinette, and miles to go before I sleep. 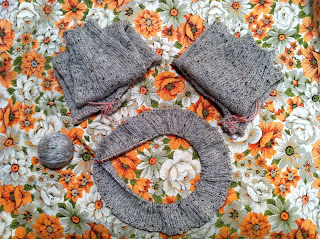 I've been making steady progress on my mum's Sweatshirt Sweater-sleeve 1 is done, sleeve 2 is off to a good start, and I should be able to cast on for the body later this week. 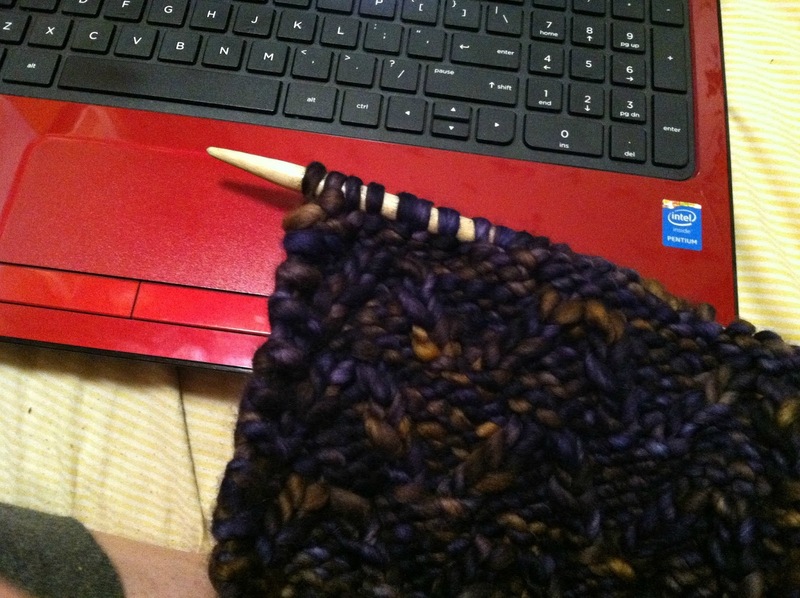 I'm hoping to get this done pretty quickly (well, for a sweater) since it's starting to get cold out. Plus, Leah and Teresa are having another KAL for people who've pre-ordered Great Northern, and I've got a hankering for a Filled With Secrets. So I really need to get mum's sweater done before I can feel good about dropping everything for a selfish sweater. I'm kind of in a rough mood with some of my knitting projects right now. I can't bring myself to look at my pink shawl after realizing I'm going to have to tear out a bunch of it, so that's going to have to get boxed up for a while. I've got tons of other projects on the needles, but something about having to tear out hours and hours of lace just really puts a damper on everything. 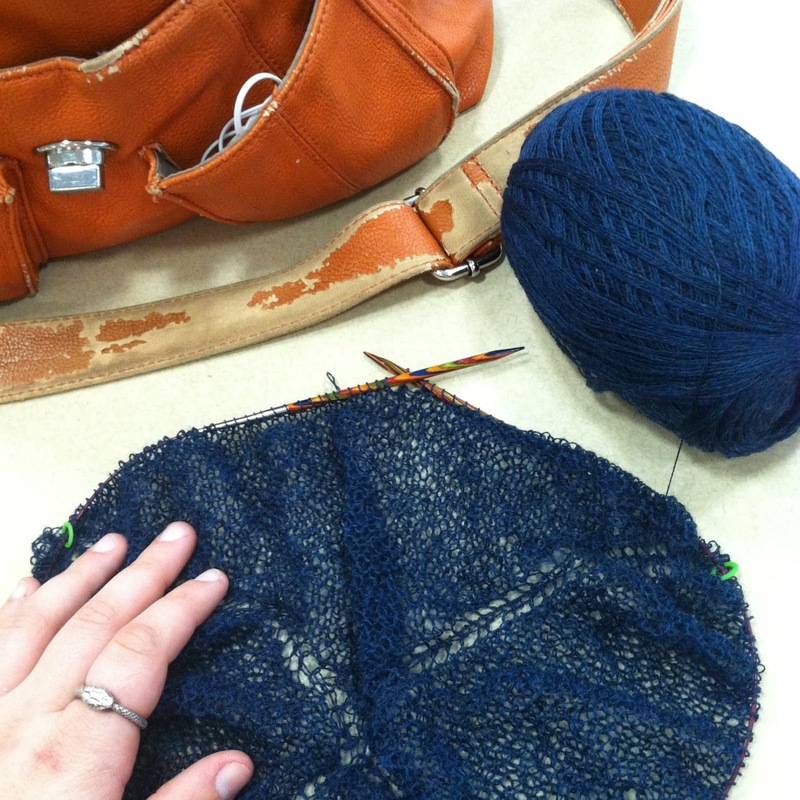 For now, the plain sweater is good company, but I might have to cast on a hat soon to get my mojo back. Happy Friday! I'm not at Rhinebeck this weekend, but I hope those of you that are have a blast! Us homebodies will enjoy the festival vicariously through social media, so be sure to take and share lots of pictures!! 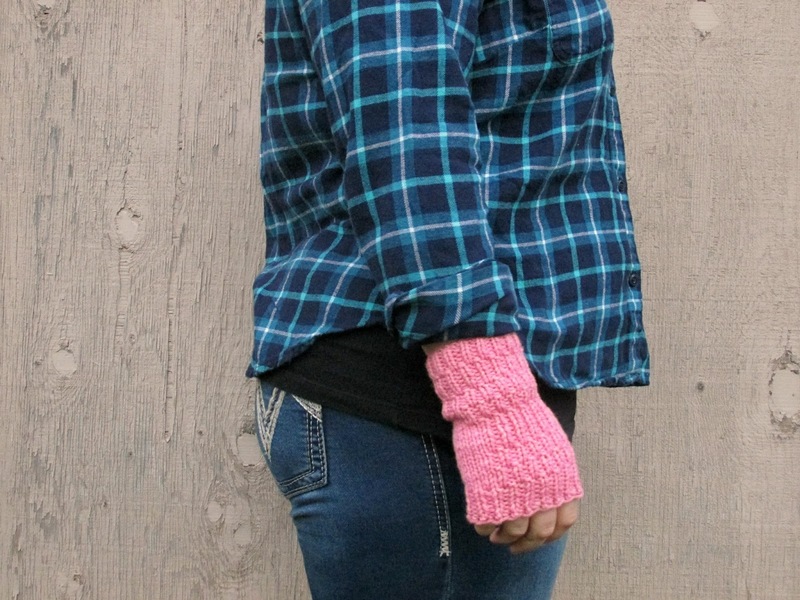 I have a quick new pattern this weekend-this one was actually super quick, from conception to finished project, and I'm super pleased with it. 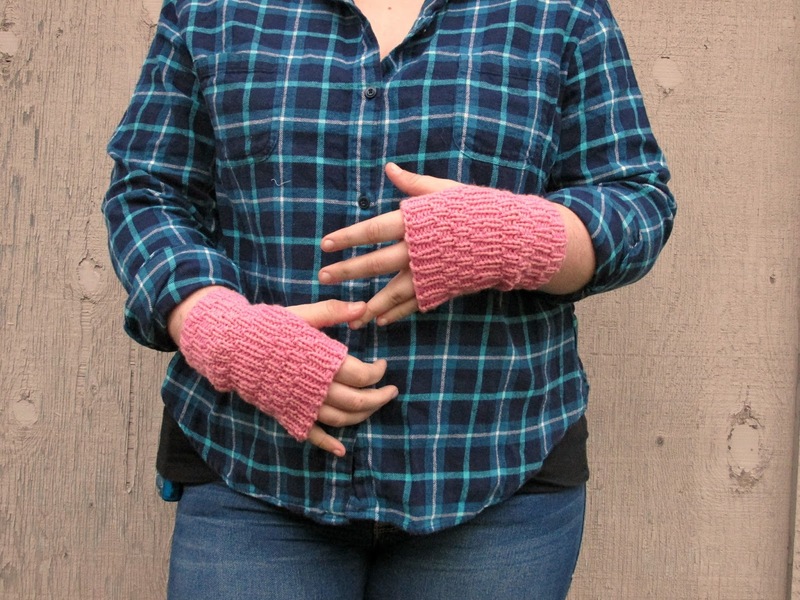 I was asked by a friend in my choir for a pair of fingerless mitts, and since this friend is super nice and always wants to hear what's new, I had to come up with something special for her. I had so much fun knitting up the sample, that I've already made a pair for another friend and I'm seriously thinking I need a pair for myself. These work up so quickly in part because they're knit flat and seamed, and honestly, I could bang out a pair in one lazy Saturday. 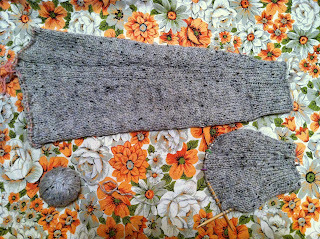 The ribbing changes up often enough to feel like potato chip knitting (just one more section! ), and then, bang, you're done. 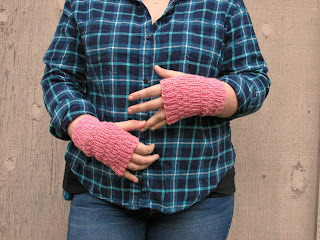 As usual, the pattern is available on Ravelry and here on my website. Happy Knitting! Today I was going to talk about my new shawl design that I mentioned on Monday. I'd worked on it all day Monday and made some really amazing progress, and I was very proud of myself. The shawl is very pink, very speckly, and I've been having a lot of fun with it. Until I looked at it yesterday and realized that there is a huge change in the color saturation where I joined the second ball. I threw it in the sink to soak to see if enough of the dye would come out so as to be less noticeable, but it doesn't look like that worked. So now it's drying, and I'll have to rip out...at least 12 hours' worth of work. I just can't, right now. This is so frustrating when it happens, and the worst part is, I wondered early on if I should stagger the different skeins throughout the shawl, but wound up they looked really close (reminder: cakes LIE). So blah blah uggity blah. I'm not a happy designer right now, and it's all on me and my choice to not listen to my gut and alternate the damn skeins. Apparently I'm on a really huge pink kick right now. I've got three design projects in different pinks, my Volcano Cowl is pink (heck, even my background tablecloth is pink!). Of course, I have tons of other projects on the needles in other colors, but pink is definitely a big thing for me right now. For most of my childhood, I absolutely hated pink. I spent most of elementary and middle school trying to reject anything feminine, and now that I'm older and have gotten over myself, I'm having lots of fun with all the pink frilly and sparkly things I never let myself enjoy when I was younger. I'm not sure when this change happened-I know I started letting myself enjoy pink and "girly" stuff long before I started critically thinking about negative societal perceptions of femininity. I definitely understand now that I wanted to be a "tomboy" growing up because I picked up on all the negative connotations that femininity had. Sometimes I want to go back to my younger self and shake her and yell "just let yourself enjoy fun things!" but I know that was a phase that I had to work through. Ultimately, it worked out for me. I'm having tons of fun enjoying all the princess pink stuff I rejected when I was younger and embracing the more feminine aspects of my personality. But I still see some girls that shy away from pink and glitter and dresses in order to appear less "girly," and that makes me sad. Fortunately, I think we're in a much better place than we were fifteen and twenty years ago, and I think lots of parents now are more aware of encouraging their kids to explore whatever they like, and hopefully things will just keep getting better, and no one will have to feel uncomfortable with themselves for loving pink! I started my mum's new sweater before NCFF, and I brought it with me in case I wanted a stockinette project to work on, but I really didn't touch it. This week, after finishing up some quick projects for my friends, I decided to make it my new lunch knitting, and I'm trying to hit the ground running (it was 37 degrees Fahrenheit this morning, so I don't really have a lot of time to get this done before winter's here). Mum picked the pattern-it's the Sweatshirt Sweater from Purl Soho, which is a bottom-up raglan. I haven't knit a bottom-up raglan since my very first sweater, back in 2012 (it was Kaleidoscope, which fell victim to poor yarn choice and has been frogged for several years now). 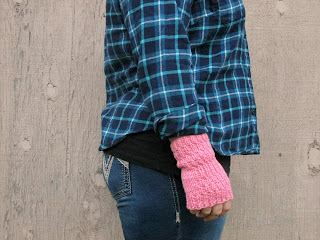 Sleeves are always my downfall, as well you know, so I was pretty excited to see that the pattern has you start with the sleeves. So far, this seems to be working, and I'm very excited at the prospect of not having to knit sleeves after most of the body is done. This week I'm a bit all over the place-my room is a total disaster right now, I've been putting off a photoshoot for three days, I'm not sure when the last time I went to the grocery store was, and I think I've misplaced a sweater's quantity of yarn. The room is the big issue, and once that's taken care of I'll be in a much better place. I like to do a major cleaning and clear-out before winter hits, so I have piles of stuff everywhere and tons of laundry to do (I really hate that I have to wash everything before I put it away for the summer and then when I unpack it everything smells like plastic bins and I have to wash it all over again). 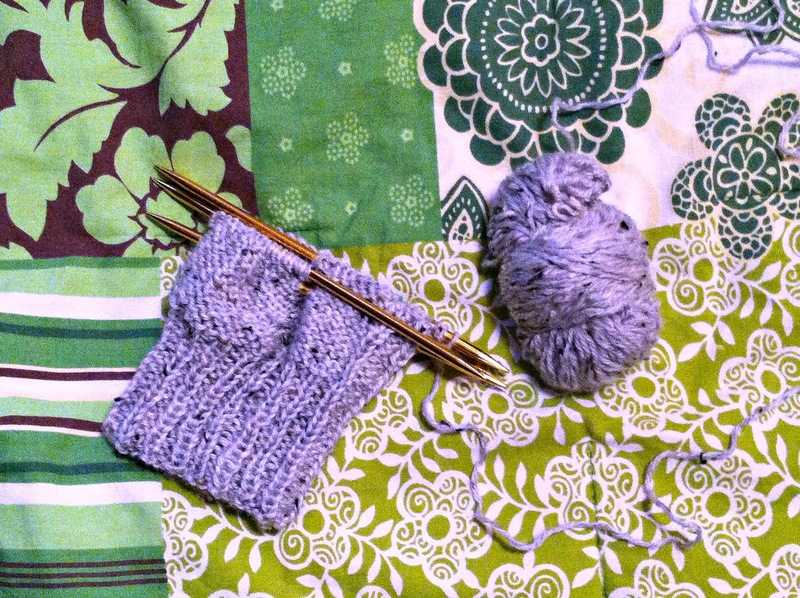 I don't feel like I've been knitting as much as usual, probably because it's hard to knit and clean at the same time, but I've also been having some trouble with pinched nerves in my shoulders and elbows. I finally went for a massage yesterday, which was definitely an A+ decision, and I should be back to my normal self in a day or two. Happy Monday, friends! I hope you all had a great weekend. Anemone came down for the weekend and we went to karaoke and to see the High School fall play. It was great to see her and have some sister time. I also wove in the ends on my mum's new socks over the weekend! I am so happy to be finished with these. Longtime readers might remember when I started them a year and a half ago I had planned to knit them two-at-a-time on a long circular. Well, that plan crashed and burned, and I went back to my trusty DPNs. I'm very happy with how these turned out, and my mum loves them. (Look at them, why wouldn't she? They're adorable.) Once I actually pulled these out of hibernation and really got into them, I really enjoyed knitting them. The tiny cables were a delight, and they were great lunch knitting-just complex enough to be interesting, simple enough to pick up and put down at a moment's notice, and small enough to carry around. I've still got a few pairs of socks on the needles, but they're all for me. 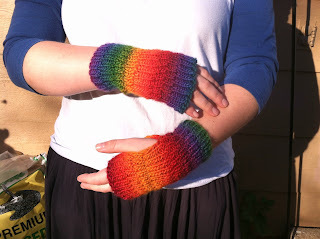 I'm hoping to get them done soon, because my sock drawer could use some fortification, but I've got a few different design projects in the works that are taking up most of my attention right now. 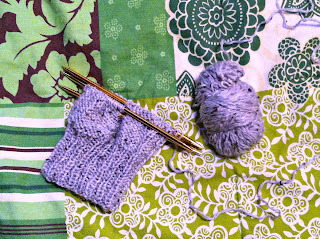 Yarn: Knit Picks Stroll "Dogwood Heather"